California's biggest wildfire on record is expected to burn for the rest of the month, fire officials said on Tuesday. The Mendocino Complex fire has already engulfed 290,692 acres (117,639 hectares) - almost the size of Los Angeles. Barely a third of it is under control, according to the California Department of Forestry and Fire Protection. Firefighters are tackling 18 major blazes across the state amid strong winds and low humidity. The fire - which comprises two blazes in the state's north - was declared the biggest in California's history on Monday. Officials had set a target to extinguish the fire by mid-August, but they now say they will need until early September. The fire is raging through a largely rural area, but it has burned 75 buildings and led to thousands of evacuations. 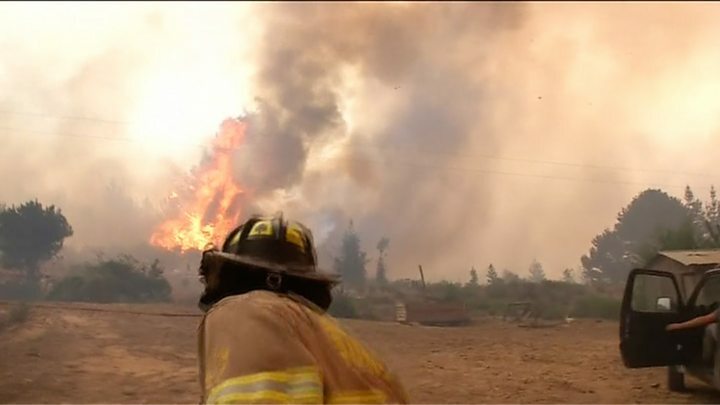 A separate blaze - the Carr fire, further north - has killed at least seven people and destroyed more than 1,500 structures. Burning through almost 160,000 acres, it was 47% contained by late Monday. Meanwhile, more fires have been breaking out, adding to the mammoth workload of fire crews. The so-called Holy Fire, in southern California, grew dramatically and rapidly on Monday, with two hikers needing to be airlifted to safety. At least 14,000 firefighters are struggling to contain the multiple outbreaks. The crews have been boosted by US army personnel and more than 1,000 prisoners. The inmates - who are considered low-risk offenders - work on a volunteer basis but they also receive $2 (£1.50) a day, plus $1 an hour. Fire crews from Australia and New Zealand have also flown over to share their expertise in battling bush fires. Firefighters told the LA Times about their gruelling schedule. One said his crew had slept - sitting up - in the seats of their fire engine on some nights. "It's been pretty crazy - they're calling this the new norm," said Omar Estorga, captain of a crew working on the Carr fire. "In years past, there were one or two big fires a year. Now they're doing three to four huge fires in a week." Nearly half of the 10 largest California wildfires on record have occurred in the past decade, according to Reuters news agency. How did the fires start? It is not yet known how the Mendocino blaze started. However, a flat tyre has been revealed to be the cause of the Carr Fire. Officials said a spark created from the wheel hitting the asphalt on 23 July grew into the deadly fire, which is still raging more than two weeks later. Why is the Mendocino fire so powerful? 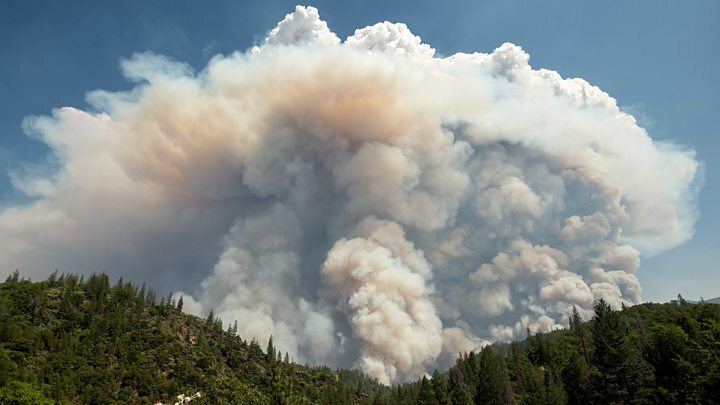 Over the weekend, dry and hot weather allowed the Mendocino Complex fire to make extraordinary gains, jumping across at least four creeks and one major road. A protective fire line - where bulldozers had cut through vegetation to create a barrier - also failed to hold it back. The LA Times said any one of these obstacles could stop a fire, but the bone-dry landscape was being fanned by shifting winds. As the flame moved in different directions, it was hard to predict and, therefore, contain. Experts say this year has been the worst start to the fire season in 10 years - partly due to the 2012-2017 drought that killed off large amounts of vegetation. Will the fires get worse? National Weather Service meteorologist Brian Hurley has warned that conditions are not going to immediately improve - with temperatures as high as 43C (110F) being forecast for some areas. In December, Governor Jerry Brown said devastating wildfires fuelled by climate change had become "the new normal". How do the fires get their names? Unlike hurricanes - which follow an alphabetical list and are named before making landfall - fires are labelled more haphazardly. The dispatch centre or, sometimes, the first crew on the scene comes up with the name, usually taking inspiration from a local landmark. The Carr Fire is so called because it started near Carr Powerhouse Road. Mendocino Complex Fire is located in Mendocino County, and is an amalgamation of two blazes.